Has the roof on your home or business started to fade or become incredibly dirty over the years? You could go ahead and pay the hefty price to replace it, or you could invest in Rancho Cucamonga, CA roof cleaning and coating courtesy of Custom Coating Restoration to make it look like new in no time. We are an experienced roof cleaning and sealing company and will work diligently to restore your roof to its former glory at an affordable price. One of the easiest ways to make your residential or commercial roof shine is by enlisting the help of expert roof cleaning and color restoration professionals. Custom Coating Restoration can utilize our power washing services in Rancho Cucamonga, CA to remove dirt, mold, algae, mildew, and more from the surface of your roof. In no time at all, we can completely transform your roof to look brand-new. n reflect up to 98 percent of heat from infrared light, which will protect your roof and stop it from heating your home or business to an uncomfortable level. Custom Coating Restoration can also apply a commercial flat heat reflecting sealer to prevent sunlight from damaging your roof beyond repair. restore it back to its original color, our Rancho Cucamonga, CA roof color sealing company can offer the best solution. Your commercial roof sits baking in the California sun all day long. This can, of course, take a toll on it over time and cause some serious damage. Luckily, however, Custom Coating Restoration can apply a commercial flat heat reflecting roof sealer to the surface that will stop the sunlight from causing lasting issues. Tile roofs can last for a very long time, but unfortunately, their coloring can fade as they start to get older. 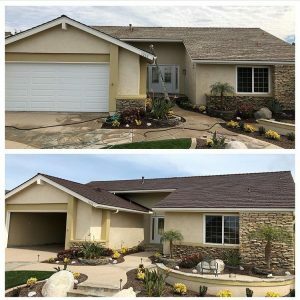 Custom Coating Restoration is a Rancho Cucamonga, CA roof cleaning and coating company that can put an end to fading and inject color back into your tile roofing. With roofing color restoration services, we can color-match each tile so that the whole roof looks uniform and as if it was just installed brand-new. Contact the Rancho Cucamonga, CA roof cleaning and coating experts at Custom Coating Restoration today to take advantage of our services. Call 800-621-6722 for more info!